Ten years ago today I flew into Berlin on the inaugural flight of Virgin’s budget route from Manchester, landing at Schonefeld Airport. 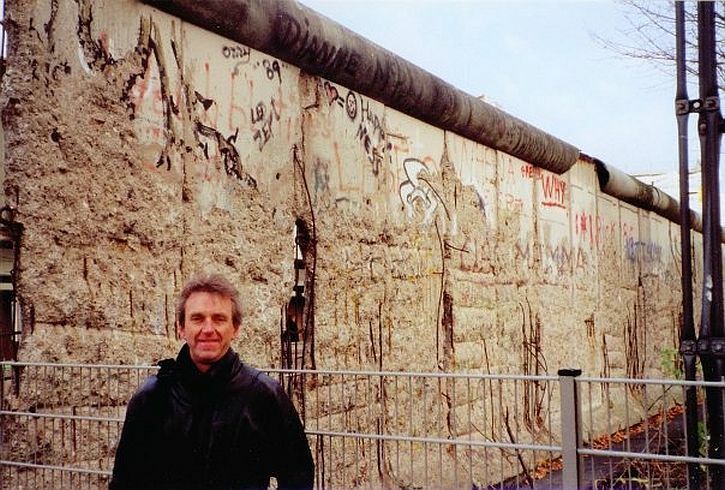 I wanted to be in Berlin on the tenth anniversary of the fall of the Wall, and arrived just as they were clearing up after the previous night’s festivities. So today I thought I’d post a few photos I took on that visit, supplemented by one or two others. 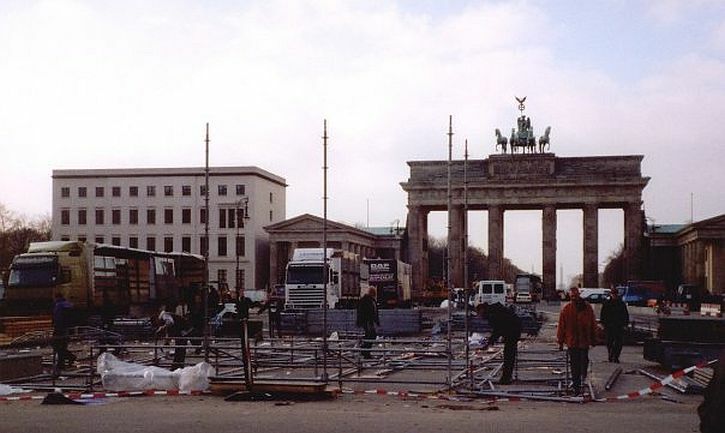 At the Brandenburg Gate, they were taking down the staging from the previous night’s celebrations. 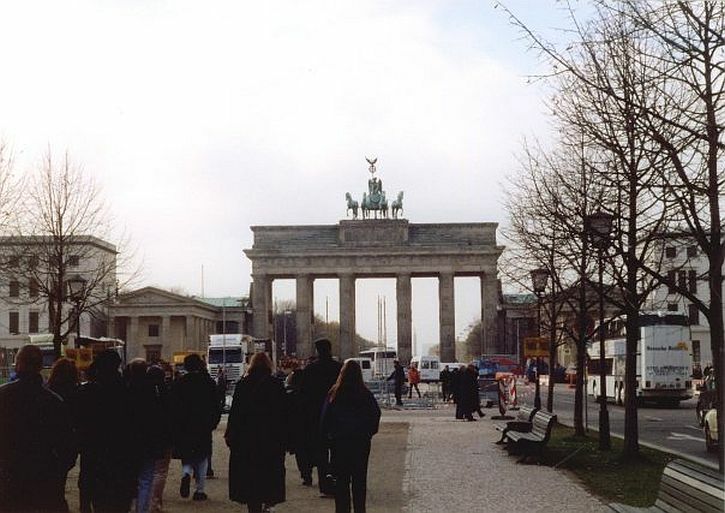 It was on 9 November 1989 that the East German politburo lifted border controls to the west, including for private journeys to west Berlin. It was meant to take effect from 17 November, but the official who announced this, Günter Schabowski, got it wrong, announcing it was effective “immediately”. So began an extraordinary night. 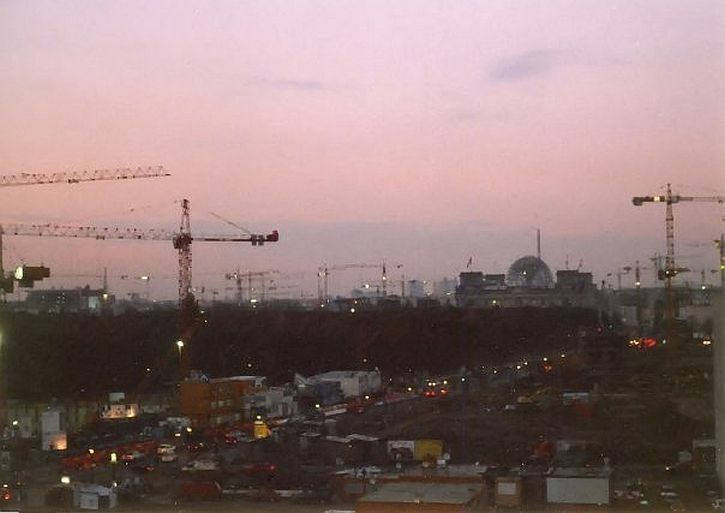 In 1999 the Berlin skyline was a forest of cranes – the largest building site in Europe – as reconstruction and infrastructure renewal followed reunification. 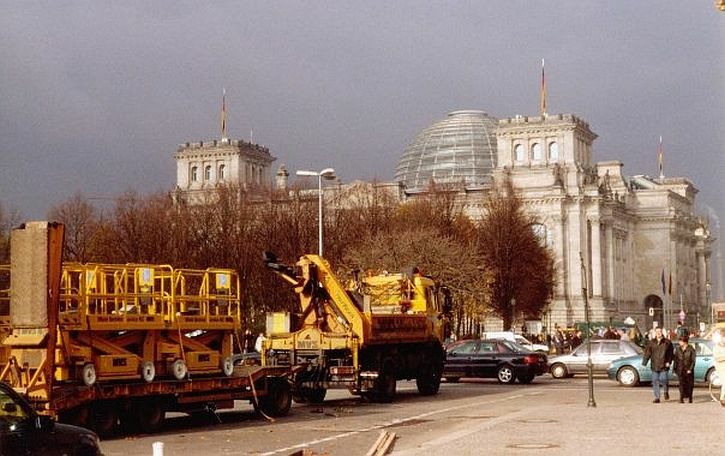 In particular, there was an enormous amount of work going on around the old Reichstag building, which had been gutted and rebuilt to British architect Norman Foster’s design. 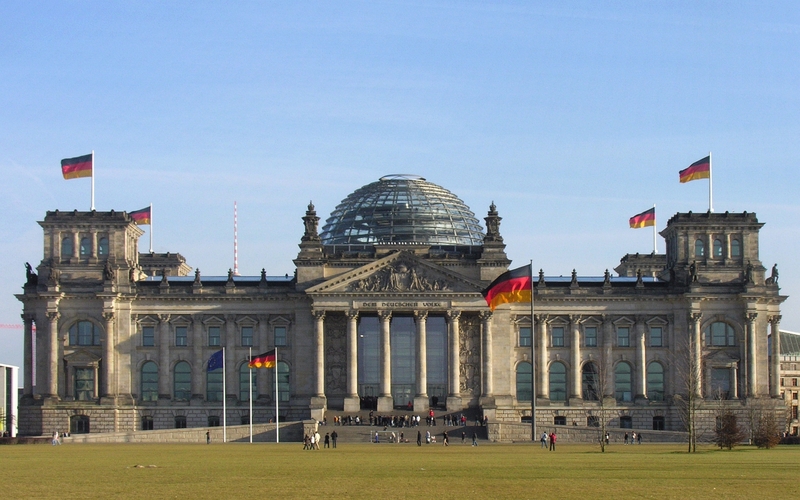 In April 1999, the German Bundestag had moved from Bonn into the new building. 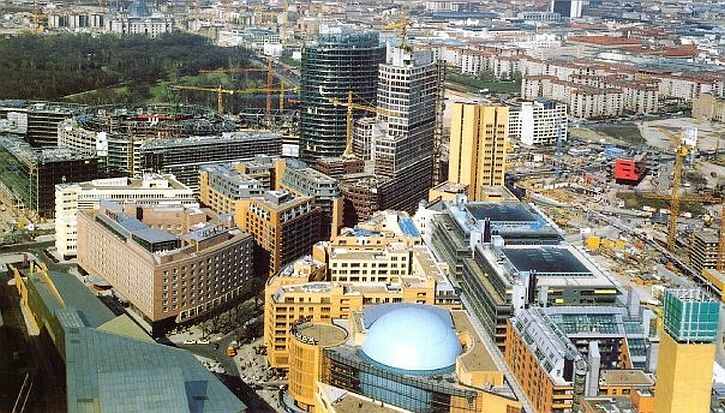 I went on a tour of the building, going up into Foster’s iconic large glass dome with its 360-degree view of the surrounding Berlin cityscape. The main hall of the parliament below could be seen from the cupola, and natural light radiated down to the parliament floor. 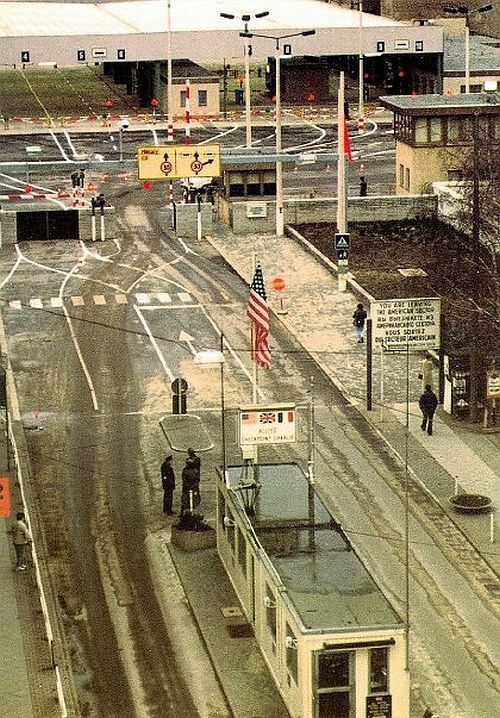 I visited Checkpoint Charlie on Friedrichstrasse – the best-known Berlin Wall crossing point during the Cold War, shown above in a postcard I picked up. 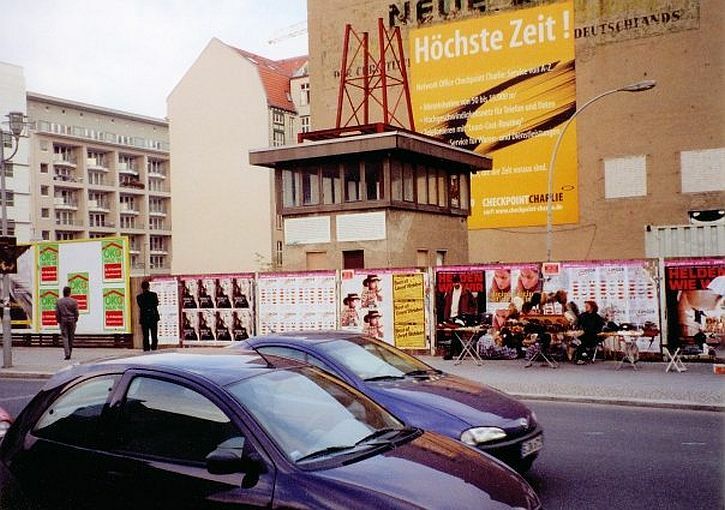 The checkpoint watchtower shown below was torn down in 2000 to make way for redevelopment. Near the guard house was the Haus am Checkpoint Charlie, a private museum opened in 1963. It was crowded and commercialised, with exhibits that focussed on contraptions used in dramatic escapes across, under or over the Wall – rather than the broader human rights implications. 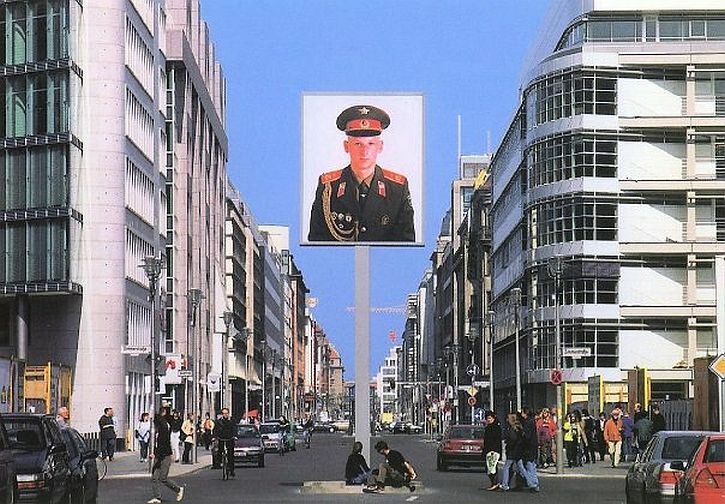 Also on Friedrichstrasse was the Two Soldiers memorial (below), with two large photographs, facing in different directions, of one American and one Russian soldier stationed in Berlin during the early 1990s. I had to see what remained of the Wall. 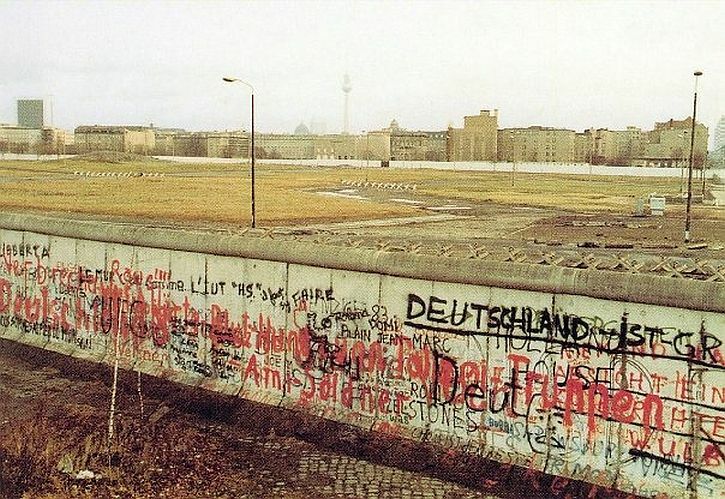 For my generation the Berlin Wall was an obscenity that divided a city and also symbolised the division of a country and a continent. 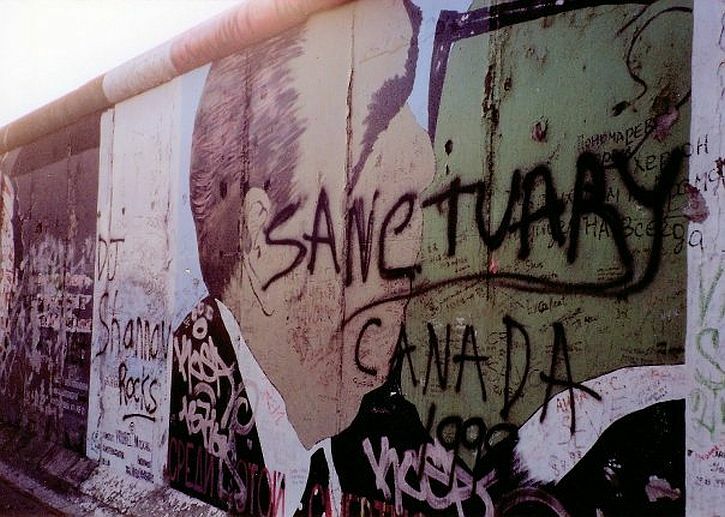 The opening of the Wall in 1989, and its rapid destruction, seemed a hopeful sign of a changing world. I went to three main sites of remaining wall: the East Side Gallery on the east bank of the Spree, over the bridge from the hostel where I stayed in Kreuzberg; the section near Potsdamer Platz, part of the Topography of Terror exhibition; and the section to the north in Bernauer Strasse. The East Side Gallery comprised a section of the Wall featuring murals by artists from all over the world, painted in 1990 on the east side of the Berlin Wall. Pictured above is perhaps the most famous, “God! Help me survive amid this mortal love” by Russian artist Dmitry Vrubel, painted 1989. Now, in 2009, most of the paintings are badly damaged by erosion, graffiti, and vandalism. Restoration, particularly of the central sections, began in May this year,though in the process the original images are completely removed with hot water. Afterwards, the artists paint the murals again, though many have refused. Muriel Raoux, Kani Alavi: ‘Many small people who in many small places do many small things, can alter the face of the world’. 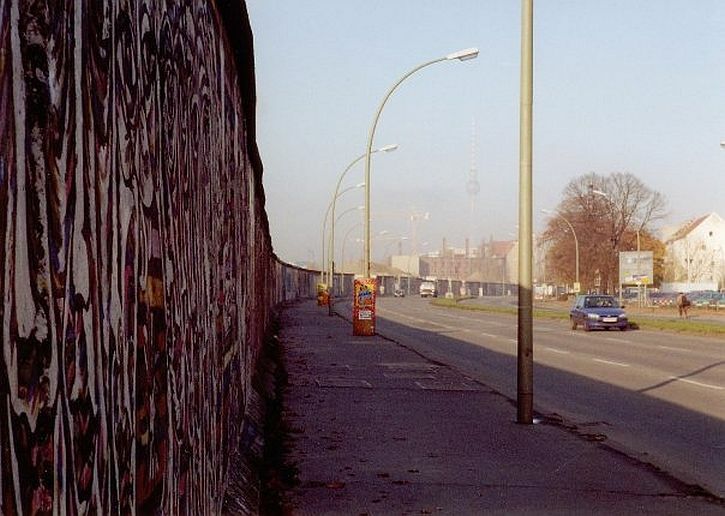 At Bernauer Strasse, the construction of the Wall, starting on 13 August 1961, made dramatic changes in the everyday lives of the people living in the neighbourhood. This was the section where the Wall ran down the centre of the street so that neighbours, friends, and relatives were separated. The house across the street was suddenly part of another political system. In desperation, people jumped out of the windows of apartments bordering West Berlin and paid with their lives. Some of the Bernauer Strasse escape attempts succeeded, however. Cameras and film crews brought these scenes to a watching world. 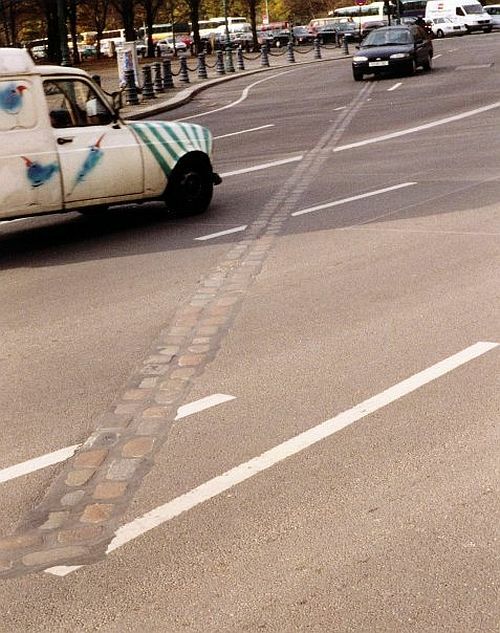 The construction of the Wall left traces visible on Bernauer Strasse even in 2009. The former ‘no man’s land’ is still largely undeveloped, and between Ackerstrasse and Gartenstrasse visitors can get a good impression of the width of the border fortifications. Here, too, is the Berlin Wall Memorial, established in 1998 by the Federal Republic of Germany. The design preserves sixty metres of the former border strip in their original depth as a physical reminder of the Wall and, at the same time, adds an artistic interpretation and shape. The Berlin Wall Memorial, the Berlin Wall Documentation Center, the Chapel of Reconciliation, and the original sections of the Wall along the cemetery Sophien-Friedhof and on the grounds of the S-Bahn station Nordbahnhof form an ensemble that is to be developed into a “commemorative landscape” over the next few years. Here I am standing in front of a third section of the Wall, close to the political and administrative heart of the city. 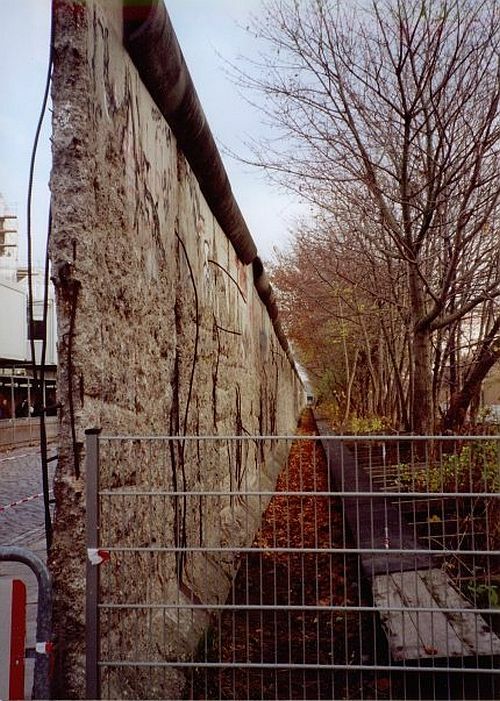 At the request of the Topography of Terror Foundation, the 200 metres of the Wall on Niederkirchnerstrasse, were preserved and placed under protection as a historical monument. When I visited in November 1999, the Topography of Terror was still under development, but the plan was to maintain this section of the Wall, as a document both of the inhumanity of the border and of how it was overcome. The Wall formed the northern edge of the Topography of Terror site and the intention was for it to be integrated into its overall design. In the mean time, it was being protected by a temporary fence, in front of which I am standing. Between 1933 and 1945, the central institutions responsible for the repressive and criminal policies of National Socialism were located on the terrain of the Topography of Terror, situated between Prinz-Albrecht-Strasse (today Niederkirchnerstrasse), Wilhelmstrasse and Anhalter Strasse. Here, in close proximity to the traditional government district, the Secret State Police, the SS leadership and the Reich Security Main Office set up their offices: the administrative headquarters of the Secret State Police and the notorious Gestapo “house prison” were located at Prinz-Albrecht-Strasse 8; the neighbouring Hotel Prinz Albrecht housed the offices of the SS Reich leadership; and the Security Service (SD) of the SS Reich leadership was established at Wilhelmstrasse 102. As of 1939, Prinz-Albrecht-Strasse 8 was also the address of the newly founded Reich Security Main Office. With the concentration of these institutions at one site, this area in effect became the government district of the National Socialist SS and Police State. This is where Himmler, Heydrich, Kaltenbrunner and their assistants had their desks. At this “site of the perpetrators”, important decisions were made concerning the persecution of political opponents, the “Germanisation” of occupied territories in Poland and the Soviet Union, the murder of Soviet prisoners of war and the genocide of the European Jews. This is where the infamous Special Police Units (Einsatzgruppen) were assembled and where the “Wannsee Conference” was prepared. There is no other site where terror and murder were planned and organised on the same scale. Apparently, the site is still pretty much as I saw it, but in 2010 the Topograpy will get a permanent home in an adjacent building. 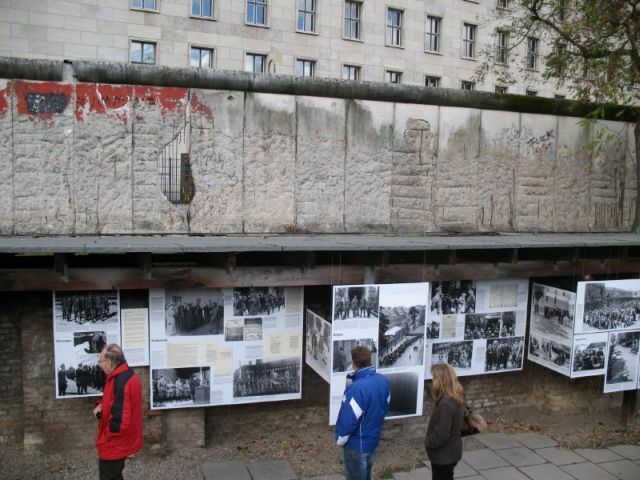 I traced the Wall across Potsdamer Platz – in its heyday in the 1920s and 1930s, the bustling heart of the city – but totally laid waste during World War II and then left desolate during the Cold War era when the Wall sliced through it (see postcard view, above). 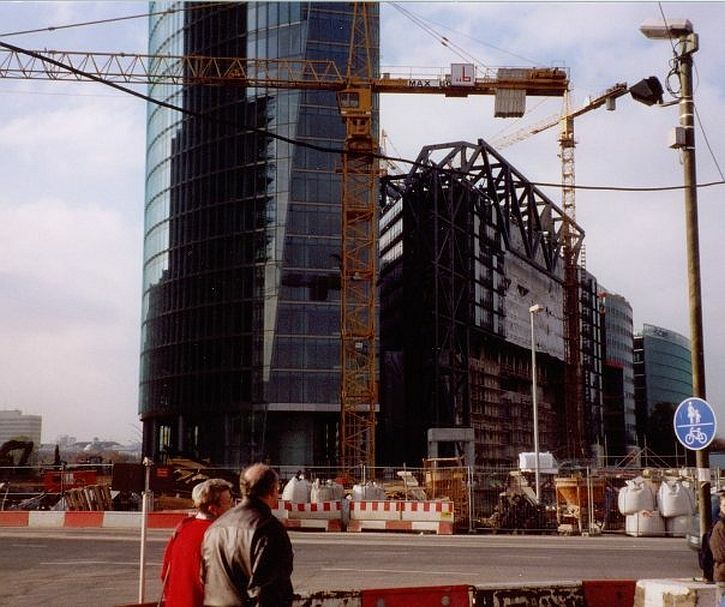 In 1999 it was reputed to be the largest building site in Europe, with steel and glass towers rising as the most visible symbol of the new Berlin, as seen in the postcard I bought there (below). 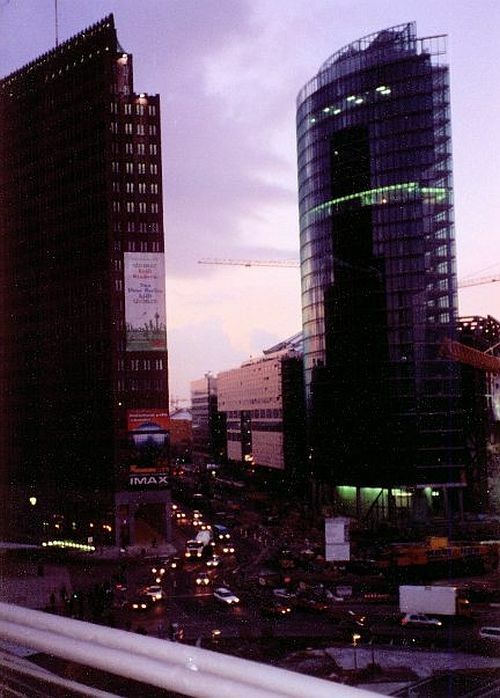 Above and below we see the Sony Centre’s Bahn Tower, Deutsche Bahn’s corporate headquarters (right) and Potsdamer Platz No. 1 by Hans Kollhoff (left). I viewed the massive building site that was Potsdamer Platz from the Info Box – designed to inform visitors about the building projects. It had been opened in 1995, a bright red structure sponsored by several German and international corporations (including Daimler-Benz, Deutsche Telekom, and Sony) as well as the German government. Entry was free but access to the roof-top viewing platform cost 2 DM (about 1 euro). The traffic tower (with clocks) is a replica of Germany’s first traffic signal, installed near this site in the 1920s. At the time the site was hugely controversial – for the way the huge area of land had been allocated for development, for the quality of the architecture, and, in the view of a number of activist groups (as seen below) , for theerasing of history in favour of rampant commercialism. The line the Wall followed here was marked by cobbles embedded in the road surface. Heavy traffic roared over the strip relentlessly. Nearby is the site of the Hitler bunker. 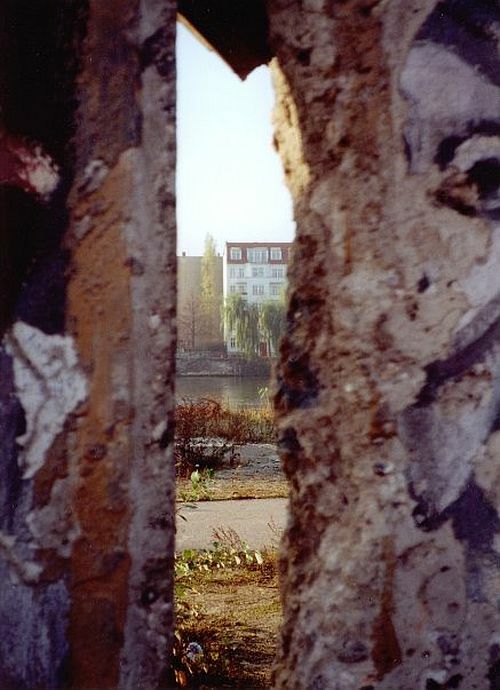 Since it was near the Berlin Wall, the site was undeveloped and neglected until after reunification. 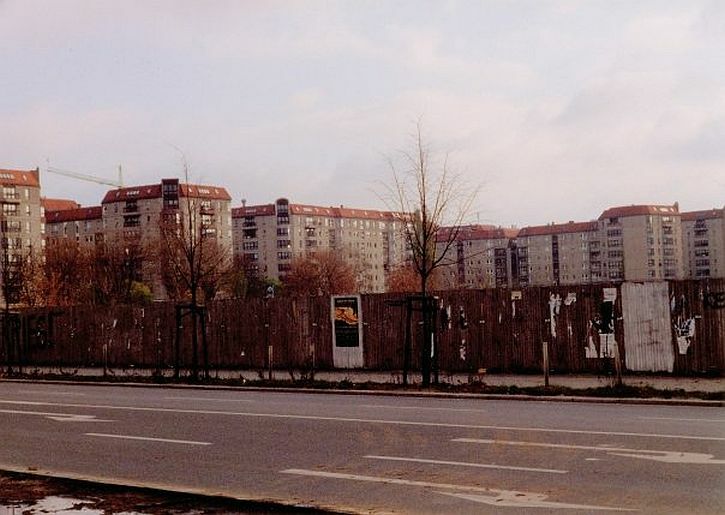 During the construction of residential housing (seen in the photo below) on the site in 1988–89 several underground sections of the old bunker were uncovered by work crews and were for the most part destroyed. From the Brandenburg Gate I walked east along Unter den Linden, arriving at Bebelplatz where, on 10 May 1933, over 25,000 books by Jewish authors and liberal leftists were collected and then burnt in the square by the Nazis. Joseph Gobbels, the Imperial Minister for Enlightenment and Propaganda watched as National Socialist students threw the books onto a large bonfire. 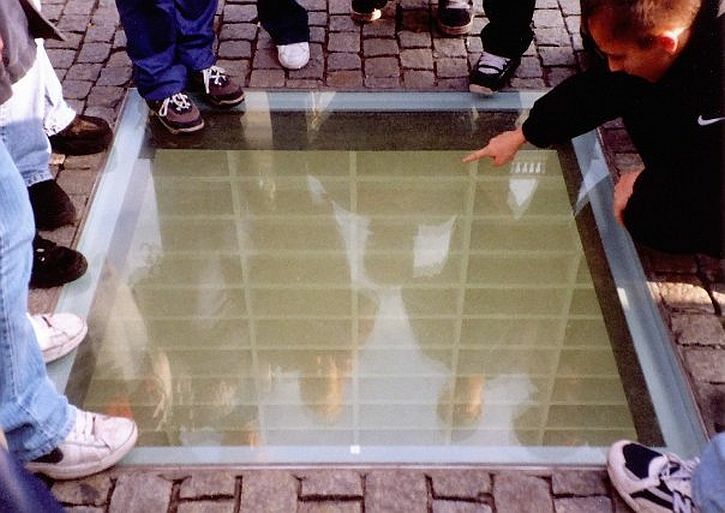 I wanted to see Micha Ullman’s underground ‘Bibliotek’ memorial which had been inaugurated on the square four years earlier. It consists of a window on the surface of the plaza, under which vacant bookshelves are lit and visible. 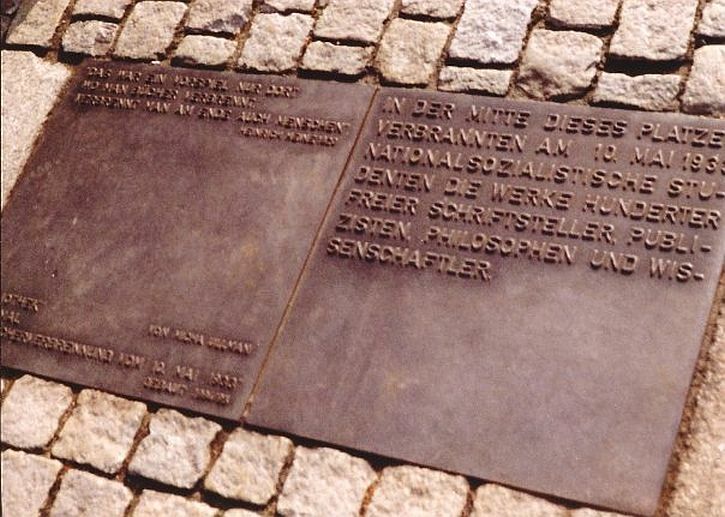 A bronze plaque bears the quote by Heinrich Heine (whose books were amongst those burnt): ‘Where books are burned in the end people will burn’. My one disappointment on this visit was being unable to enter the then recently-completed Jewish Museum. 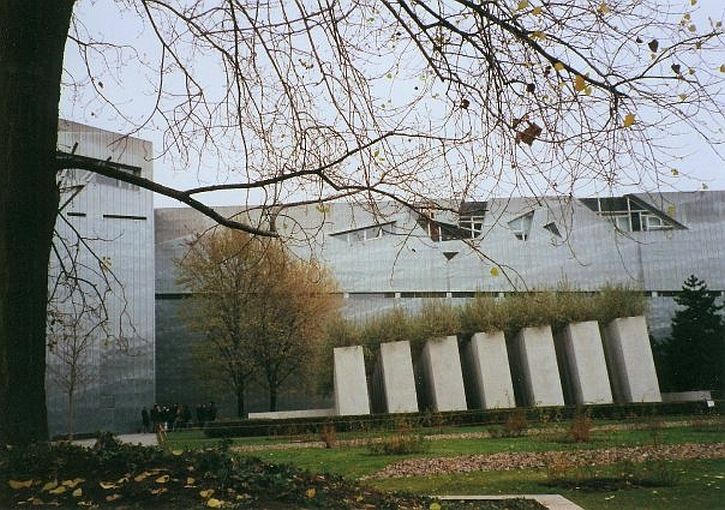 The building, designed by Daniel Libeskind was first opened to visitors in January 1999. It soon became a great public attraction boasting 350,000 visitors as an empty shell in the two years that followed. For some reason, on the day I turned up outside along with a crowd of other expectant tourists, the building was unexpectedly closed. So I explored the outside of this dramatic building, with its zig-zag structure and exterior marked by multiple slashes. Next to the Museum is the Garden of Exile. 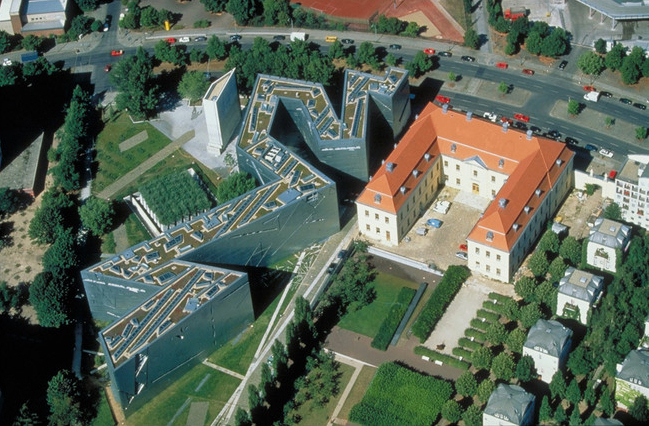 Daniel Libeskind’s design is based on two linear structures which, combined, form the body of the building. The first line is a winding one with several kinks while the second line cuts through the whole building. At the intersections of these lines are empty spaces – “Voids” – which rise vertically from the ground floor of the building up to the roof. Libeskind imagines the continuation of both lines throughout the city of Berlin and beyond. The Garden of Exile (seen above) attempts “to completely disorientate the visitor. 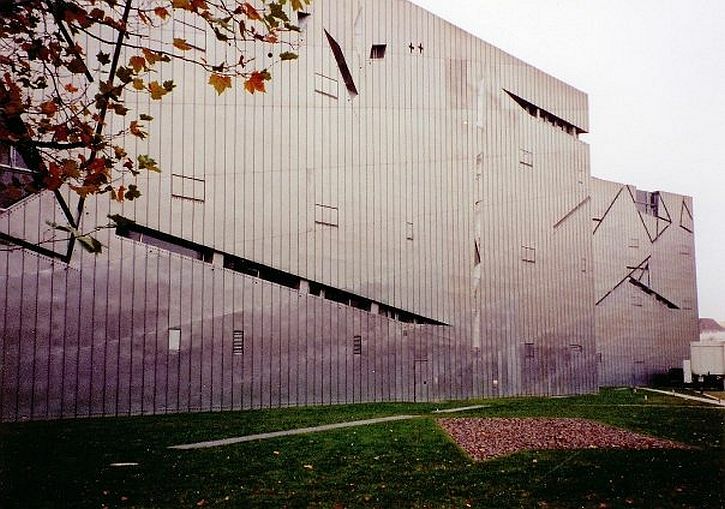 It represents a shipwreck of history.” (Daniel Libeskind, 1999). In the garden forty-nine concrete stelae rise out of the square plot. The whole garden is on a 12° gradient and disorientates visitors, giving them a sense of the total instability and lack of orientation experienced by those driven out of Germany. Russian olive grows on top of the pillars symbolizing hope. 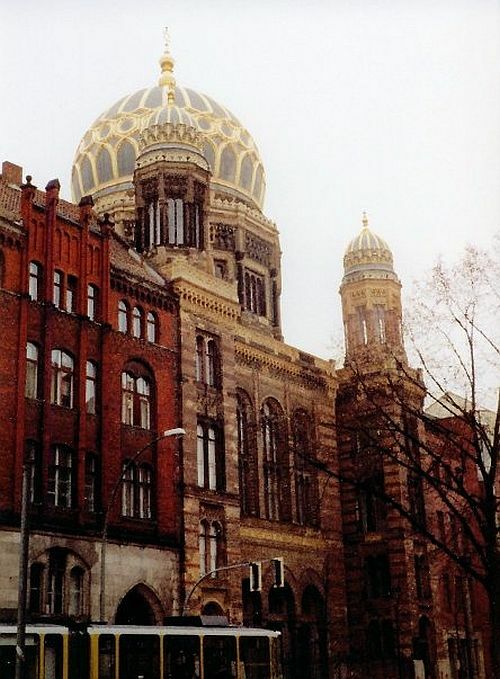 From there, I went to Oranienburger Strasse to visit the New Synagogue (Neue Synagoge), which at the time of its opening in 1866 was the largest synagogue in Berlin. The synagogue was saved from destruction by the Nazis on Kristallnacht in 1938 by the actions of Wilhelm Krützfeld, a local police commander. It was largely destroyed by Allied bombing in 1943, and most of the ruins were demolished in 1958 by the German Democratic Republic authorities. The restored front section of the synagogue was reopened in 1995 as a museum and Jewish community centre. The synagogue’s golden dome was a beautiful site, glittering in the November sunlight. 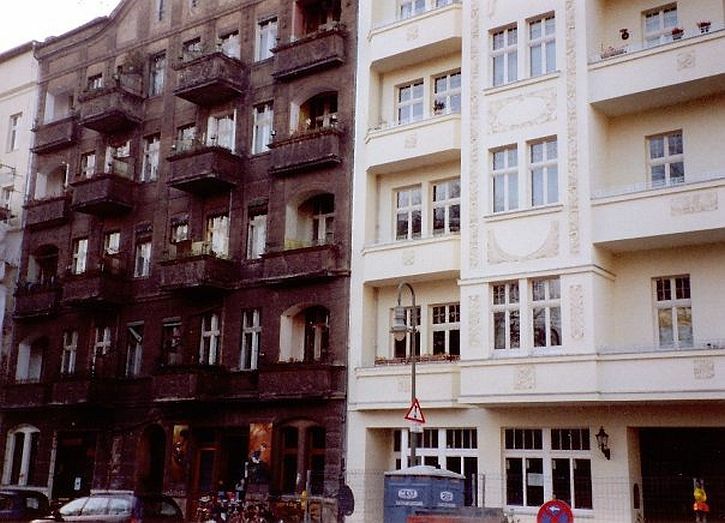 The last two photos here reflect the pace of change evident in the district of Prenzlauer Berg. 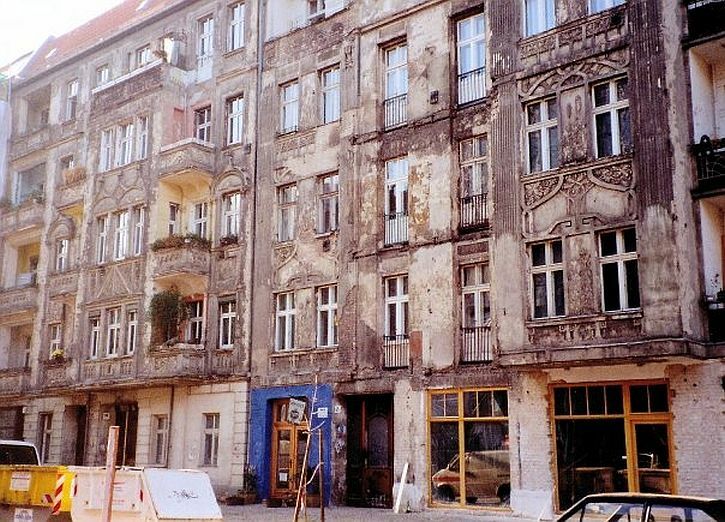 After reunification in 1990 Prenzlauer Berg became a centre for bohemian Berlin youth, but by 1999 was experiencing rapid gentrification. It was already rapidly turning into the fashionable district of restaurants, cafés, galleries and boutique shops that it has become today.